A Homeland Denied follows the horrific journey of Waclaw Kossakowski, a young Warsaw University student whose peaceful life was changed dramatically and with far reaching consequences that fateful day of 1st September, 1939. From imprisonment in the notorious Kozelsk prison to the forced labour camp in the Siberian Arctic Circle, the compelling story pulls the reader into a world of suffering and brutality it would be impossible to imagine. Forced to dig runways in temperatures as low as – 50oC while under constant threat from sadistic guards, it was an indescribable living hell with death the only companion. He endured and witnessed atrocities which haunted him for the rest of his life with so many friends murdered or frozen to death in the unforgiving cruelty of Siberia. But fate intervened and the icy wasteland was replaced by the blistering heat and dry deserts of the Middle East, where the student who had never picked up a gun was taught to fight – in the Italian campaign, at Monte Cassino, Ancona and Bologna. Yet the intense desire to return to his homeland never left him and only memories of his idyllic life before the war sustained him when he sank to the lowest depths of despair. Waclaw could not know of the terrible suffering of his family or the sacrifices of his countrymen as they fought so desperately to keep Warsaw, only to be denied their homeland in the cruellest way imaginable. Although they were ultimately the victors, they lost everything – their home, their loves, their country and nothing was ever the same again. In a country governed by Communist Russia and controlled by their secret police, it was impossible to return under fear of imprisonment or death and no knowledge of the achievements and bravery of the Poles was allowed to be known. No one was safe under the Stalinist reign of terror. Everything was strictly censored or destroyed and with the passage of time few people were left alive to tell their story. It was only in 1989 that Poland truly broke free from the Russian yoke and its people gained the freedom they had fought so valiantly for. This dramatic and poignant story based on the memories of Waclaw Kossakowski is recounted in vivid detail and documents a tragic period in the history of the Polish people in Europe. 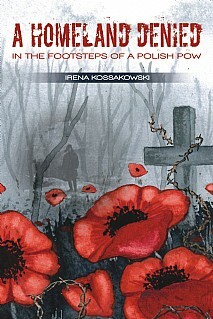 His story demands to be told and ensures that many other unrecognized Poles will not be forgotten. This compelling book will be of huge appeal to all with Polish connections, everyone with an interest in WWII, military history and stories of indomitable courage.